It was independently also found in the insect collections of the Museum für Naturkunde in Berlin, where it was awaiting discovery since the 1930s, when it had been collected on Sulawesi. The new species is pitch-black, has an enormous body size (the male measures about two-and-a-half-inches long), and its males have long, sickle-shaped jaws. The findings have now been described in the open access journal ZooKeys. The species belongs into the digger wasp family, which is a diverse group of wasps with several thousands of species known from all over the world. Female digger wasps search for other insects as prey for their young and paralyze the prey by stinging it. Prey selection is often species specific, but the prey of the new species is unknown. 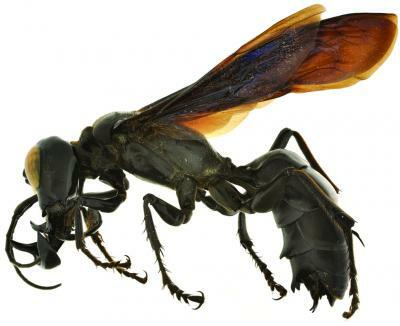 With its unusual body size and the male’s jaws, the new species differs from all known related digger wasps, so much so that it was placed in a new genus of its own, Megalara. 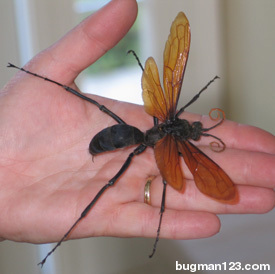 check out the california Tarantula Hawks, I was with my friend who is an Entomologist hiking in San Diego area and he tried to net a dragonfly but he missed it and chased it toward me he started to wonder why I was running then once he caught it he realized it was a huge wasp. He wears contacts so he didn’t notice he was chasing the Godzilla of wasps at me. He later looked up its one of the biggest of the wasps in the world the one he caught was 4in from stinger to head Imagine if that had reached me all pissed of before he caught it in the net. maybe these are the tracker jackers from the hunger games!!?? Seriously, f*** off with the hunger games ****. No one cares. They’re totally the tracker jackers.